Planning your summer? Check out our weekly camp calendar for June, July and August 2018! Registration forms can be downloaded in PDF and Word formats. 1 Jun 25-29 Design and Build For campers fascinated with the beauty of geometry! 2 Jul 3-6 (4 days) Famous Art Math Connections For campers who wish to uncover the secrets of famous artists! 3 Jul 9-13 Brain + Eyes + Light = Colour For campers who fancy investigating the world of colour and light! 4 Jul 16-20 Sifting Through Science For campers who explore everything they can get their hands on! 5 Jul 23-27 Treasure Boxes For campers who love collecting, sorting and displaying their treasure in boxes. 6 Jul 30-Aug 3 Matter IS Everything For campers whose main pursuit is to figure out the physical world around them! 7 Aug 7-10 (4 days) Fluid Explorations For campers who seek a better understanding and use of the properties of fluids! 8 Aug 13-17 Secret Formulas For campers who enjoy mixing ingredients for tastier results! Weaving mathematics concepts into engaging, hands-on construction activities, this includes a wide assortment of collaborative and independent learning-station activities that emphasize construction, geometric challenges, and spatial visualization. Experiential activities involve AcadeCampers in free exploration of materials and lay the foundation for such mathematical challenges as Create-A-Shape, Dowel Designs, Polyhedra, Symmetry, Tangrams, and What Comes Next? Many of the activities connect strongly to the real world and potential careers. For extra dynamics, Friday afternoon culminates in a Build It Festival. Creatively using what they learn about area, perimeter, fractions, fractals, shapes, angles, lines and mathematical operations, AcadeCampers uncover the secrets of famous artists such as Kandinsky, Mondrian, Calder, Klee, Warhol, Jasper John, Picasso, Vasarely and Pollock. They build on newly acquired knowledge about drawing and painting techniques as well as mathematical and science skills to develop their own technique. Display and presentation of the AcadeCampers’ art portfolios are reserved for Friday afternoon at the Vernissage. AcadeCampers are quickly physically involved in investigations of light, colour, and the wonders of how our eyes work. They are provided with background information on colour, light, and how the eye and brain sense and comprehend colour. Experimenting with chromatography, diffraction gratings and colour filters, they separate the colours of candies, tease a rainbow from a lightbulb, decode messages from abstract art, appreciate how many “hidden” colours a source gives off, unveil the answer to why an apple looks red, and uncover how colour filters help astronomers scan the heavens. Then, they design a Light Show to wow everyone on Friday afternoon. Sensory input is at the heart of early learning; it even manifests the drive toward scientific inquiry. 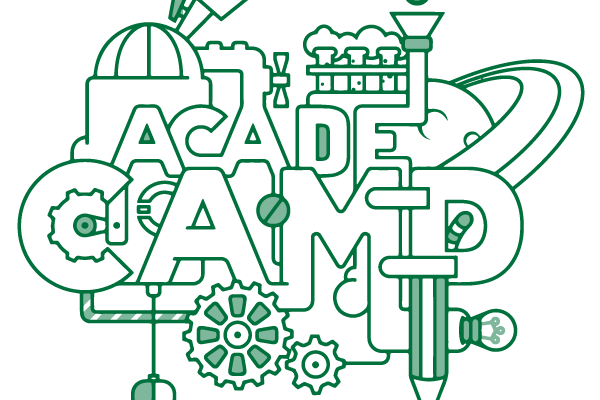 This session’s free-exploration learning stations integrate math, graphing, and data analysis as AcadeCampers investigate various physical properties of objects. They investigate material properties, including those of materials that sink or float; magnetic and non-magnetic objects; materials that are opaque or transparent; absorbent or waterproof and more. Throughout, AcadeCampers discuss their work in the significant, real-life context of recycling and the environment. In the culminating Friday afternoon activity, campers separate materials, from a Mini-Dump full of the week’s recycled items, using the knowledge, tools, and techniques learned. This session builds on children’s fascination with collections of small, everyday objects to introduce discrete mathematics, statistics, numbers, logic, and language in a cooperative learning environment. AcadeCampers create personal collections of recycled, “found,” and inexpensive objects and investigate their properties, calling many important science and math skills into play. Graphing, sorting, and classification activities also encourage appreciation for recycling. Challenges that require careful observation, sorting and classification, logical thinking, graphing, and analyzing data are woven throughout the week’s activities. Collectively, AcadeCampers will design and set up a Museum Exhibit for their treasure boxes to be viewed Friday afternoon. This session capitalizes on children’s natural curiosity. In a series of intriguing hands-on learning station activities, AcadeCampers learn to think critically and gather and apply evidence to expand their knowledge, just as scientists do. They learn what matter is—and what it is not! Matter surrounds us, interacts with us, and is us, all day, every day! It’s the stuff we can feel, hold, weigh, smell, see, touch, and taste. AcadeCampers generate definitions and understandings of the properties of solids, liquids, and gases, and apply these definitions and understandings to classification of “challenging substances.” AcadeCampers design and create a PREZI and/or a Virtual Museum Exhibit to showcase their knowledge and classifications to be viewed Friday afternoon. AcadeCampers explore daily the properties of liquids in a series of fun and fluid activities. They explore the ubiquity and properties of liquids using introductory language and simple concepts. They play classification games, observe how food colouring moves through different liquids, and create secret salad-dressing recipes and an “Ocean in a Bottle.” Activities such as Raindrops and Oil Drops prompt discussion and better understanding of oil slicks and other environmental issues. The AcadeCampers’ Ocean Awareness and Preservation Multimedia Presentation is set for Friday afternoon. This session provides wildly engaging, sweet, and tasty activities solidly packed with math and science. AcadeCampers participate in highly motivating real-life experiences with chemistry and conveys key science/math skills and concepts, including cause and effect, central to later understanding of controlled experimentation. They generate their “secret formulas” investigating the properties of substances to make their own personal brands of paste, toothpaste, goop and ice cream and more. The week’s learning and activities peak at the Taste Taking Contest on Friday afternoon. No Comments on "AcadeCamp 2018"